There are problems every smoker has faced at one time: how to keep their smoking accessories from getting lost and how to take them on the go discreetly and efficiently. Personally, I never came up with an answer. Then one day a friend I had met and bonded with over smoking weed posed the question to me – what would I keep in my essential stoner kit? Back and forth we went, listing item after item. Though I already had most of the items, I realized they lay scattered around my apartment. Then I thought about the all the times I simply stuffed a sandwich bag of bud in my pocket to take on the go. And I started to get fired up. I knew there must be a better way! So I started looking around the internet to see what kind of solutions I could find. 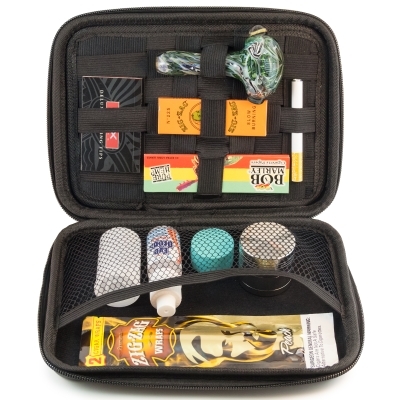 Surely someone must have already created an essential stoner kit to take on the go and stay organized around the house. Shockingly, I found only a few sub-par products. Cases with little space and fixed arrangements with too few accessories were the norm. That’s where the real journey started. At this point, I was already importing the flagship Perfect Pregame Flask from China. 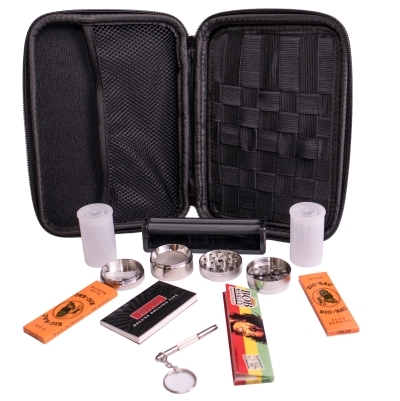 So, I reasoned – if no one else can make a decent essential stoner kit, why not me? Slowly but surely found sources for the items my friend and I concluded belonged in a stoner kit. Two hundred blunt wraps here, a hundred one hitters there, and one UPS box at the time the kit started to take shape. But the biggest challenge still remained. I just couldn’t find a case that would be big enough to fit all the essentials, small enough to travel easily, and versatile enough to hold any type of accessories. Sample after sample, they came and went, but none were good enough. Finally, I struck paydirt. I found the perfect case. Not too big, not too small, and with a completely customizable layout, I knew I had a winner. The struggle to turn this idea into a reality did not end there however. After snapping some pictures and selling a few locally, the time had come to sell Perfect Pregame’s stoner kit to the masses. But I quickly discovered I had been a bit naive. There are all kinds of laws and restrictions for selling smoking accessories on different online platforms. And of course, I had violated plenty of them. So began a year long struggle. A lot of research, thousands of dollars down the drain in unusable inventory, painstaking dealings with online merchants who couldn’t bother to give me the time of day – this was my reality. I have to admit, I really wanted to give up and forget it. The only problem – Perfect Pregame’s life as a company hung in the balance. I’d gone to far to turn back now. What’s in your essential stoner kit? Leave a comment and let us know! Innovation is our goal and we want to bring our customers exactly what they need.